Imagine being able to print something from anywhere, whenever you need to. If a customer wants a printed invoice at the end of a job, voila! You can use your mobile device to print to a portable printer in your truck, and hand them a copy. If your office needs that same invoice (so they can sign off on it) before you leave your job site, you can print to the office printer as well. It is instant gratification in its simplest form, giving you the power to keep detailed records, stay on top of your business, and provide that little extra customer service for your clients at the same time. Companies like Google and HP are offering printing in the cloud; just another one of the many benefits of cloud computing. 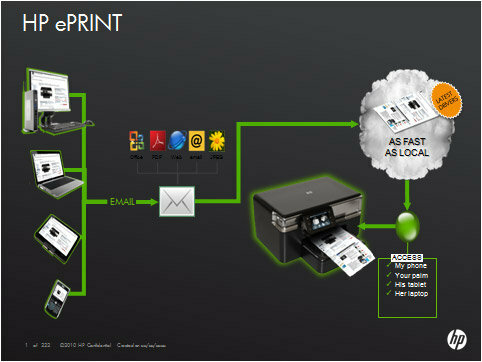 This functionality allows you to print to a printer of your choice from any device that offers email services. Printers that offer cloud printing services come with a specific email address. As long as you have this email address, you can print to the printer from anywhere, at any time, without being directly connected to the printer. While this may seem counterproductive to the “green” movement, businesses have to face that fact, that at this time, it is not possible to be entirely paperless. E-print can help give your customers peace of mind, allow your technicians to capture signatures and approvals in real time, and allows your business to keep detailed records for auditors and tax purposes. Cloud printing, or e-printing, is just another fascinating new technology that can improve your business processes. Combined with a robust service management solution, you can keep your business organized all while wowing your customer. Learn about printing in the cloud today, and think about its potential for your business. Have you had experience with cloud printing? How has it helped your business? Posted on February 9, 2012, in Printing and tagged Google, Printing, service proz, wireless. Bookmark the permalink. Leave a comment.